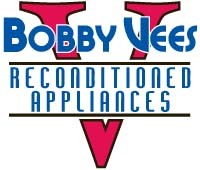 Bobby Vee's has a large selection of used and reconditioned stoves, refrigerators, washers and dryers. We also offer local repair service for the same major appliances. We offer a 90 day guarantee on all appliances. Local delivery is available on appliances. Partial list of available appliances listed below, click category tabs above to view specific categories. Call 708-895-4147 for more info. Bobby Vee's is powered by Habari 0.7. Theme: hMallow2. Salted to taste by Bobby Vee.